Win over $500 of booze, wine, beer and mixers! Enough to stock a full bar! —— Tickets are $10 each. 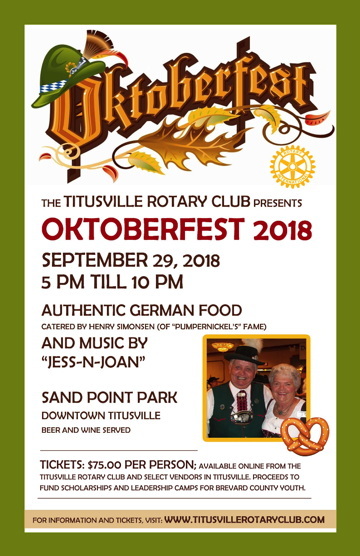 Drawing will be held September 29, 2018 at the Titusville Rotary Oktoberfest at Sandpoint Park pavilion. Winner need not be present. Proceeds go to fund Rotary Scholarships for area High School graduates. Tickets can be purchased from any Titusville Rotarian or at the Titusville Area Chamber of Commerce where the Barrow is on display. Each year, the Titusville Rotary Club sets a goal to raise money for academic scholarships, made available to Titusville area youth attending college or post-secondary training. The club also allocates a portion of funds raised to send local high school juniors and seniors to Rotary's famed week-long Youth Leadership Academy (RYLA). To meet our club's fundraising goal this year, we are staging a Bavarian "Oktoberfest," featuring authentic German food and music, along with wine and beer products. This ticketed event will take place on Saturday, September 29th, at Sand Point Park. We are projecting that the Oktoberfest celebration will attract approximately 200 persons. As part of the fundraising efforts for this event, we are asking select, local corporate groups and businesses to consider being a sponsor. The sheet attached to this letter outlines the three levels available for this year's Oktoberfest; please consider supporting us by committing to a sponsor level. On behalf of the Titusville Rotary Club, thank you for your willingness to consider this request. Should you have any questions, please feel welcome to contact our event coordinator, club member Steve Brewer, at 321-543-0771.